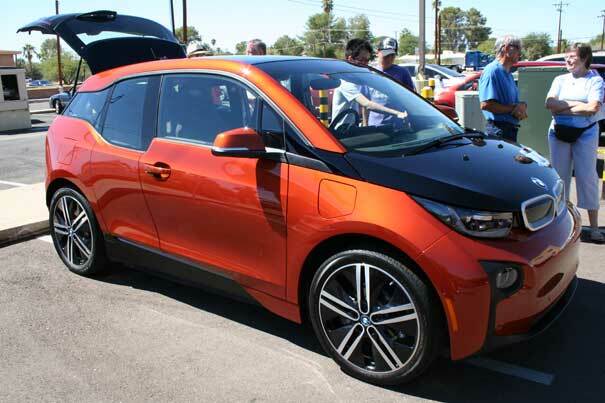 National Drive Electric Week / Tucson - know locally as Tucson Plugs In 2014 - was a grand success on several levels. 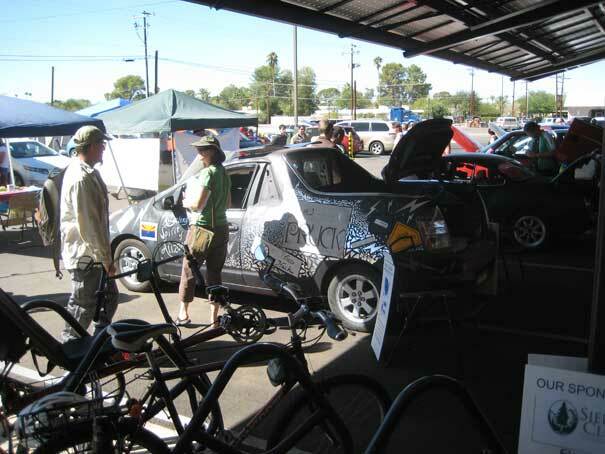 Our local EAA chapter, the Tucson Electric Vehicle Association (TEVA,) was the principle organizer and the basic template began as a reproduction of what we did 2013. It ended up being, however, a collaborative effort with Tucson’s diverse community of environmental activists who were organizing a complimentary version to the New York City People’s Climate March, which was also occurring on September 21st. I’m not sure how many other NDEW city organizers were able to bridge these two activities into one, but I’m very happy to report that our union worked out beautifully. So many people to thank at this end and so little space to list them all! I only wish the local media (apparently asleep this particular weekend) could have been more attentive. 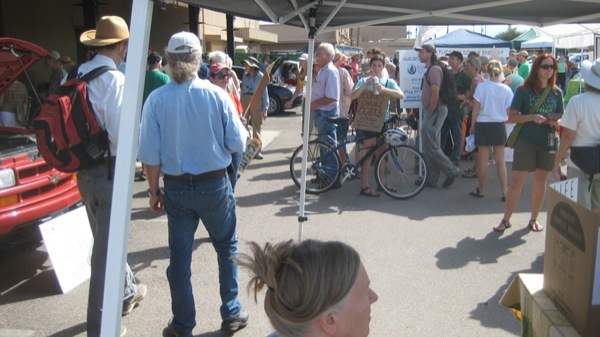 This shot taken approximately mid event, about half an hour after the Tucson People's Climate March arrived. The participants of that activity, now integrated into the event, interact with exhibitors and others. It's hard to see details of any EVs in this particular photo, since there are so many people milling around. But that's a good thing! lot of the Bookman's Sports Exchange store, 3330 E. Speedway Blvd., conveniently located mid town at the Rancho Center. there provides the perfect backdrop for what promises to be our best event ever. the solar awning and we also anticipate the return of local auto dealers who will be showing their latest electric car offerings. all dedicated to promoting sustainability and environmental responsibility will be exhibiting with us. you ride it over, park for awhile and share your experiences with us. to walk or bicycle over, if convenient . . . or take the Speedway SunTran bus. Registered attendees report 227,041 electric miles driven.